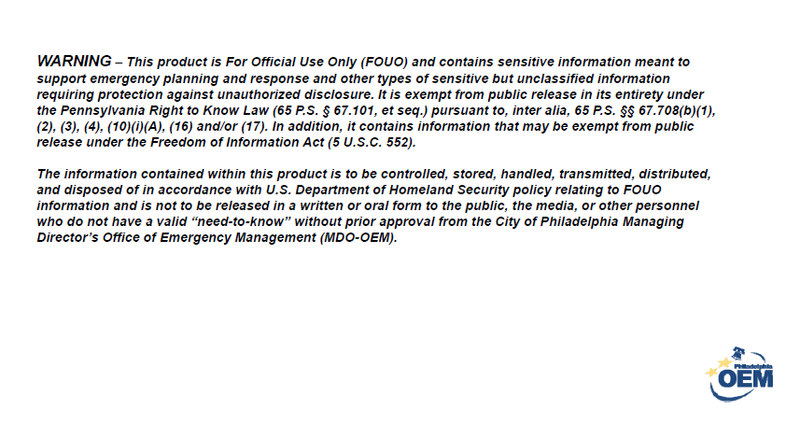 A document prepared by Public Property Commissioner Bridget Collins-Greenwald and sent to Council President Darrell Clarke, marked “For Official Use Only (FOUO)” as sensitive emergency planning and response for public facilities in Philadelphia, was intended to answer questions and address concerns regarding building security raised at an April meeting of the Committee of the Whole. The document was subsequently uploaded to the public City Council web server, where the Declaration located it yesterday during routine research using Google to “mine” the web for content of interest. *Presumably a reference to Shumpert Caldwell, sergeant-at-arms. Shumpert with his Council patron, Democratic Mayoral nominee Jim Kenney. From his Facebook page. COMMISSIONER GREENWALD: You’re in very good hands with Shump, though, I have to say. I feel safe around Shump. I would too, but even Shump doesn’t have an S on his chest. “Posture levels” to be designated by the Security Advisory Group, colors redacted to protect municipal security. Outside of public safety agencies, the City lacks a clear process to quickly assess, adapt and respond appropriately to a crisis within a Philadelphia facility or a neighboring jurisdiction, be it a technological hazard or adversarial incident. Under the “Unified City Facility Security Criteria” program overview provided to City Council, a ten-member Security Advisory Group “determines the need for a posture change after a threat or incident.” The group is made up of executives in the Mayor’s Office, commanders from the Police and Fire Departments including the DVIC fusion center, the Director of Risk Management, the Director of Public Safety, the Commissioner of Public Property, and the Director of Emergency Management. The plan then prescribes an operating procedure to enhance security upon an increase in posture at a given facility, such as designating a separate visitor entrance and checking building notification systems when under an “elevated posture,” and “ensure building information binder has updated and correct information and is located near fire command panel” both under elevated and high posture levels. An email to the City Council’s communications office this afternoon, notifying them of the document’s public availability and inquiring as to why it may have been uploaded to the site, had not been returned as of this posting. The Declaration has given the City the opportunity to suggest redactions, should they wish, prior to our publication of the document. We’ll analyze it in more detail soon, hopefully with some input from City Hall, either the 2nd or 4th floor will do.